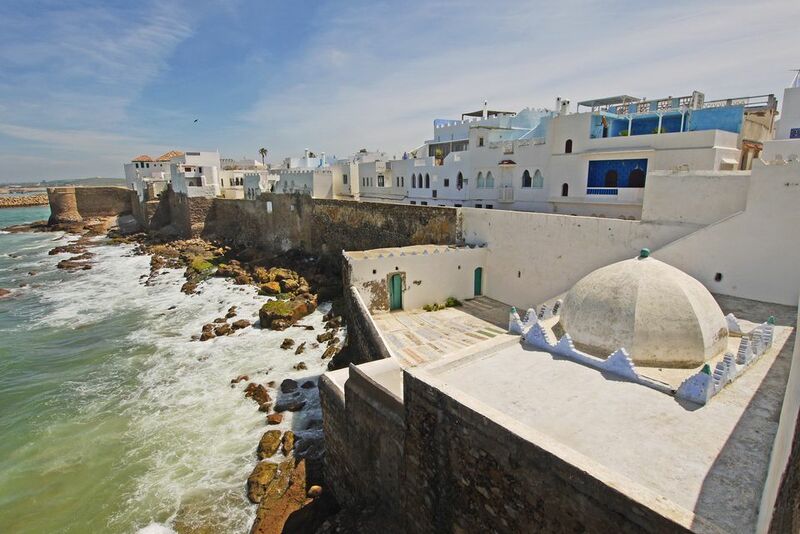 Located just south of Tangier in northern Morocco, picturesque Asilah overlooks the Atlantic Ocean and is a popular summer getaway for locals and visitors alike. The fortified seaside town has many charms, including safe swimming beaches, quaint streets painted in soft shades of white and blue and excellent restaurants inspired by the town's Spanish heritage. Many visitors travel to Asilah to explore its historic center, or medina - where cobbled streets, carved doors, crowded souks and bustling plazas offer authentic opportunities for shopping and socializing. Modern-day Asilah dates back to the ancient Phoenician port of Zilis, which was founded around 1500 BC and located a few kilometers northeast of the present settlement. Much of Asilah's medina was built under Arab Muslim rule between the 8th and 10th centuries AD. The dramatic ramparts that surround it, however, were built by the Portuguese, who conquered the town in 1471. The Portuguese maintained control of Asilah until 1589, when it briefly returned to Moroccan rule before being taken over by the Spanish. In the 17th century Moroccans won control of the town again and in the 18th and 19th centuries it became a notorious base for pirates. This led to widespread bombardment by the Austrians in 1829 and from 1912 to 1956, Asilah was once more part of Spanish Morocco. Today it has regained its independence but its colonial past is reflected in the distinctly Iberian flavor of its cuisine and culture. All visits to Asilah should start in the medina. The town's historic center is a treasure trove of Portuguese, Spanish and Moorish architecture, and is best explored on foot. Enter via one of the two main gates (Bab el-Kasaba or Bab el-Homar) and spend a day admiring the old town's ornate carved doors and graceful historic buildings. Keep an eye out for Asilah's famous murals, which adorn the walls in and around the medina. These wall paintings are sometimes commissioned and always celebrated every summer during the annual Asilah Cultural Festival. The medina is full of authentic Moroccan souks, where adept hagglers can easily pick up excellent bargains on North African furniture, jewelry and spices. Asilah is renowned as a haven for artists, and as such, artisan and custom crafts are of a particularly high quality here. Asilah's iconic ramparts were built by the Portuguese more than 500 years ago and have been restored many times since so that they remain amazingly intact today. They still have plenty of old-world charm, however, and offer the perfect spot for a sunset stroll, or for taking aerial photographs of the town and the ocean spread out below. Although the ramparts plunge directly into the sea in many places, Asilah does have its fair share of beautiful beaches. The best is Paradise Beach, located 1.5 miles/3 kilometers south of the medina. Clean and beautiful, it's a great place for swimming, sunbathing or even riding a camel along the sand. There are other good beaches north of Asilah that can be reached by taxi or horse-drawn carriage. Asilah is full of traditional Moroccan guesthouses or riads, many of them in or close to the medina. These accommodation options are defined by their intimate size, atmospheric rooftop terraces and personalized service. Recommended riads include Hotel Dar Manara, Hotel Dar Azaouia and Christina's House (the latter being a good option for those on a budget). A little out of town, peaceful Berbari Guest House is perfect for those looking for a rural escape, while Al Alba is an excellent choice for those that prefer hotel living with the benefit of a great restaurant. If you want to enjoy the beach, the summer months (June to September) boast warm water and hot sunshine. However, this is also peak time for tourists, both local and foreign, so prices soar and the town is crowded. Winter (December to February) can be chilly; therefore, spring and fall are the best times to visit with pleasant weather and minimal crowds. The Asilah Cultural Festival takes place in late July or early August. Asilah is a 35-minute drive from Tangier Airport, and about an hour's drive from Port de Tangier Ville. Taxis are available from both. You can also get to Asilah by train from Tangier, Casablanca, Fez or Marrakech. Long distance buses stop in Asilah - check with the CTM or Supratours offices for an up-to-date schedule. Getting around Asilah is easy, either on foot in the medina, or by shared taxi, mini taxi or horse-drawn carriage. There is never a shortage of transport but bargaining is advised - as is finding out in advance what a reasonable fare might be for getting from A to B.